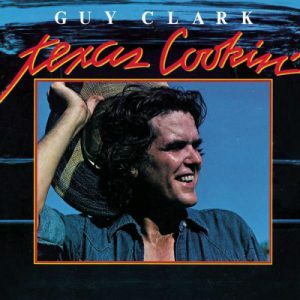 Before Nashville, I’d heard and enjoyed Guy Clark on KFAT in Gilroy, but I wasn’t all that familiar with his work. My second day in Nashville, Nicolette Larson introduced me to Guy. We sat around that evening in a publishing company office and Guy and Steve Fromholz played songs and I played along on my steel and Nicolette sang. I was captivated, honored, and enchanted. Guy sang some of the songs directly to me, and once, when my attention drifted to what I was playing on the steel, he said, “You weren’t paying attention; you missed that part,” and he repeated the part. He was right, and it was a pivotal part in the song. Our little get-together prompted an invitation to record with Guy the following day. The session was the traditional, time-tested, approach: everyone plays at the same time and listens and responds to each other. So, I’m there at the session, as is everyone else: Guy and his band—Danny Rowland, Charlie Bundy, and Chris Laird; and a load of luminaries: Susannah Clark, Emmy Lou Harris, Rodney Crowell, Jerry Jeff Walker, David Briggs, and Brian Ahern. Neil Wilburn was the producer. So, wow! As soon as I meet these people, I’m playing with them! This is my kind of fun! Guy walks us through the song, “Good to Love You Lady,” and I’m pretty sure I get the structure. I get to split the solo with the fiddle. We play it once to get the feel. I’m on my best behavior, in other words: listen intently, play pretty, and don’t get in anyone’s way. We start playing and I try not to keep reminding myself that, if I mess up my solo, everybody has to start over, and I’d be henceforth remembered as the one who couldn’t do his part. No pressure. The next day, I got to watch some magic by Neil Wilburn, where he got an amazing sound from my very tame and quiet 10-string dobro, as we did “Black Haired Boy,” that Guy and Susannah had written. I had simple little fills in that tune. Neil had also, amazingly, achieved great separation on “Good to Love You Lady” with all the vocal and instrument mics. Originally, everyone sang on all the choruses and many sang on verses, and that was the original idea: everyone. But Guy wanted to showcase various voices, a much better idea because of the unique nature of the voices involved. So Neil was able to just pull up each voice as needed. Later on, by the end of the song, everyone is singing. It really builds quite well. The next Guy Clark chapter will be about the 1977 Japan Tour.